After browsing for some new muffin recipe online the other day I baked the Apple Cinnamon Muffins for my kids and they don't like it! I'm not going to share the recipes here because the apple muffin is more like steamed cake to me. Both my daughters, they loved cupcakes especially the one with chocolatey flavour. 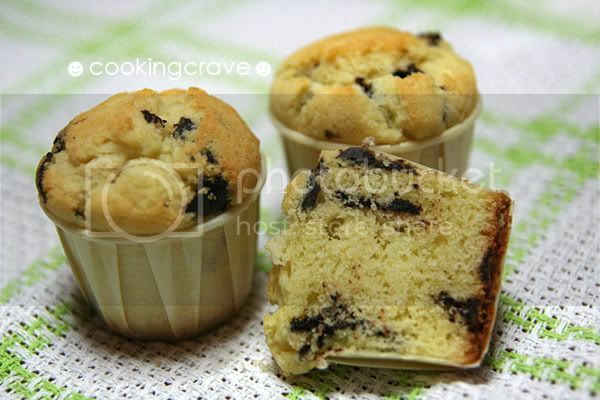 They both loves chocolate and I end up baking this Aunty Yochana's Chocolate Chips Muffin☻ for them as breakfast. I make the small cup size for they can bring it to school as well. Since my house still have a dark cooking chocolate bar, I substitute the same amount of chocolate chips with this chopped dark chocolate. It's moist and soft, not too sweet and it's delicious! Sieve self-raising flour into a mixing bowl. Add butter and rub with fingertips till it resembles breadcrumb. Add in sugar, salt and mix well. Mix wet ingredients together - egg, milk, vanilla and add into dry ingredients. Stir lightly - do not overmix. Add in chocolate chips/chopped dark chocolate and stir lightly. Scoop batter into paper cup, using ice-cream scoop -3/4 full. Bake at 180C for about 20 mins till golden brown. Remove from oven and cooled before serving. Note: I got 20 cupcakes using smaller size paper cup and I fill in the batter using spoon. wow another new blog of yours. 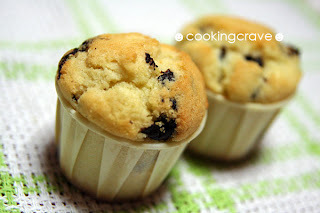 Hmm, the muffin looks yummy la.